Luxembourg, November 24, 2014 – Artec Group, a leading developer and manufacturer of professional 3D hardware and software will be showcasing its Shapify Booth in Germany from November 25 to 28. The world’s first full-body scanner of its kind, Shapify Booth can scan a person or an object in just 12 seconds. The data it generates is used to automatically produce a detailed 3D model, which can then be 3D printed to create a full-color figurine called a “shapie”. Just like photos, “Shapies” are ideal presents or souvenirs. The Shapify Booth will be demoed in foyer FS02, while Artec's handheld scanners will be presented at stand E05 in hall 11. Every Shapify Booth consists of a platform and four wide-view Artec scanners, which rotate around an object to scan it from all angles. These high-resolution scanners are able to capture even the smallest details, down to folds on clothes. As a result of the process, 700 scanned surfaces are generated, which are then sewn together into one file by Artec’s sophisticated algorithm and are ready for 3D printing. The scanning process is fully automatic and can be operated with two buttons; no previous experience is required. Since Artec uses no laser radiation but exclusively flashlights, there are no health risks. The booth is ideal for big shopping malls, amusement parks, airports and other areas with a high footfall. The Shapify Booth is user-friendly and easy to use. The booth can easily be moved to other locations. Hundreds of shapies can be sold monthly, new customers attracted and regular customers will be stimulated to return. Thanks to the flexibility of Artec's recently released Scanning SDK, software applications for Artec scanners can be customized free of charge or newly developed. The new developer kit extends the functionality of these high-resolution portable full-color 3D scanners immensely, ranging from prototyping, medicine, orthopaedics, archaeology, design, and industry to engineering applications. The best example is the new Shapify Booth, which scans people in 3D. Starting in the UK, the Shapify Booth was demoed in Paris, Shanghai, Tokyo and the US, where it was received with great interest. A very good introductory video of the Shapify Booth was made by The Wall Street Journal during an event in Beijing: http://on.wsj.com/1wr2zvV. The launch of the Shapify Booth at Britain’s biggest supermarket chain, ASDA, provides another good overview: http://bit.ly/1s6ONsT. 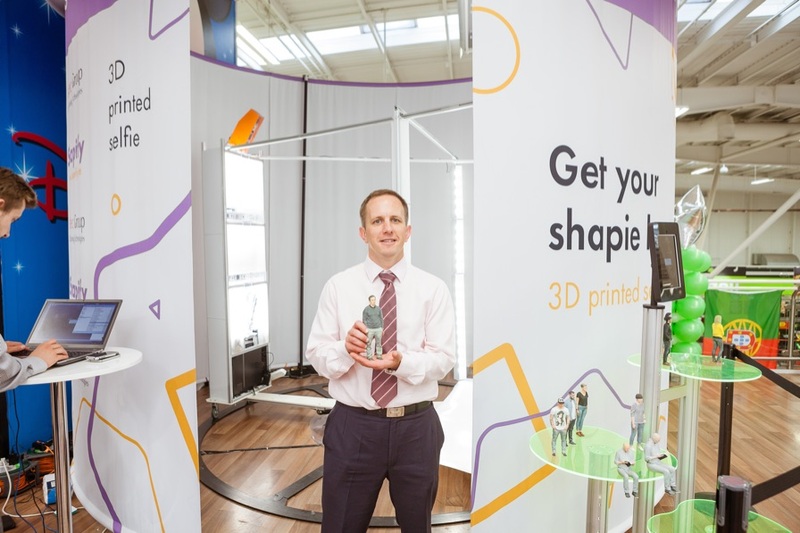 If you want to try the Shapify Booth for yourself, or to contact an Artec representative for further information on Artec’s 3D scanners Eva or Spider, we’d be happy to arrange a press event for you. Artec CEO Artyom Yukhin and CBDO Leonid Volkov are available for comments. Further information on the Shapify Booth, including technical specifications can be found here: https://shapify.me/partner/booth. Artec will be based at stand E05 in hall 11, where 3D specialists will be demoing professional 3D scanners Eva and Spider. The Shapify Booth will be showcased in foyer FS02 in the same hall. Artec Group is an international group with subsidiaries in the U.S. (Palo Alto), Russia (Moscow) and Luxembourg. Artec develops and produces innovative 3D solutions and products. Artec has a team of professional experts in the collection and processing of 3D surfaces as well as biometric facial recognition. Artec’s products and services can be used in many industries, such as security technology, engineering, medicine, media, design, entertainment, fashion, heritage preservation, and many more. Shapify, the service for the creation of 3D models, was designed and introduced by Artec Group in 2013. For more information about Artec Group please visit http://www.artec3d.com.